This superb book was produced following the highly successful Radio London summer reunion broadcast in 1997 from the m.v. Yeoman Rose off the coast of Walton-on-the-Naze, Essex. See what happened behind the scenes and how many former Radio London broadcasters met again after 30 years. Includes Ed Stewart, Ian Damon, Tony Brandon, Keith Skues, Duncan Johnson, Tommy Vance, Dave Cash and many of the original founders and behind the scenes staff, including Ben Toney, Tom Danaher and the Pierson family. 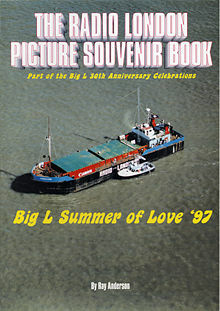 Ray Anderson's Picture souvenir book contains over 130 photographs of the Radio London Summer 1997 RSL broadcast.